Discussing hive design with Mahenge beekeepers. It was great to meet Father Jacob and his team of men who traveled close to 1,000 kilometers to spend time with us to learn about African Beekeeping. 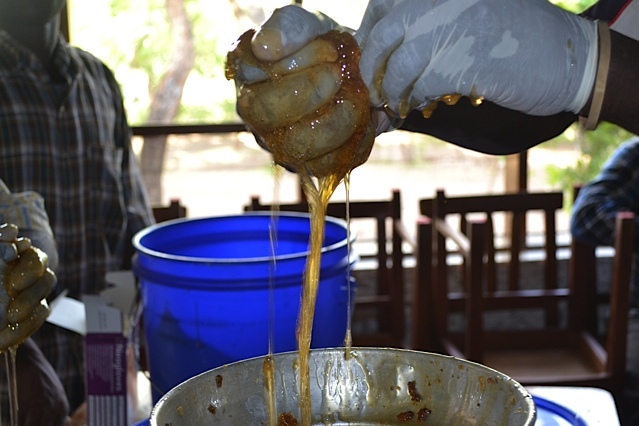 We had theory training combined with a practical workshop in the field where we harvested honey together, cleaned comb, and later processed the honey for bottling. The theory training went well and there were many questions about hive type, baiting of hives and placement in the field. One of the team's biggest struggles was having bees abscond from hives they put out near Mahenge town. They had been building hives that were initially too large for the occupations that were taking up residence there and they also did not have tin roofs. Both of these things can cause big problems for new arrivals. When African bees occupy a hive they need to be able to have the ability to control the environment they are living in. That means a very big hive for a medium sized or even large swarm can initially be very scary. The bees are constantly fighting issues with humidity as well as hive pests like small hive beetles, large hive beetles and wax moths. The colonies need a smaller more manageable environment to control. That means smaller hive size. There are very few times I would recommend larger than a 20 bar top bar hive to start. The bees can always be transferred into a larger hive later on when they become situated and stronger. The hives ALWAYS need a tin roof tilted towards the door side when hung, or it will be impossible for them to control the humidity of the inside environment. Tilting the hives towards the door prevents rain from inadvertently running in the door and pooling in the hive. The practical training was fun but due to local farmers starting to farm near seven of our hives we had to move them. This was amazing to me for two years ago we put these hives in dense forest. The local agronomists cut the forest down and consequently removed much of the good bee fodder that caused us to situate there in the first place. We got decent honey in only 40 percent of the hives we opened. 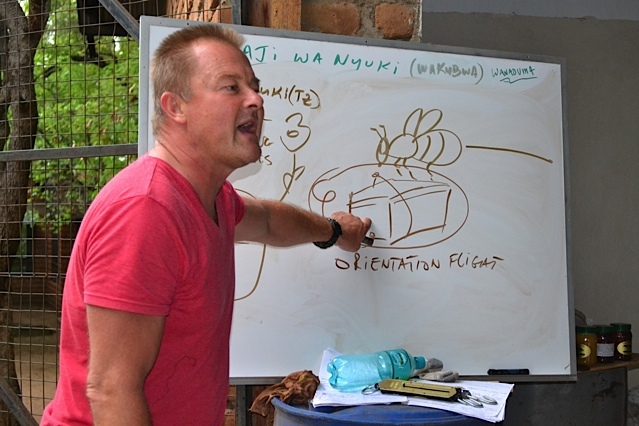 However, the training however went well as we were able to use these developments as teaching points for the need to conserve local habitat if beekeepers wish to succeed with large honey harvests. 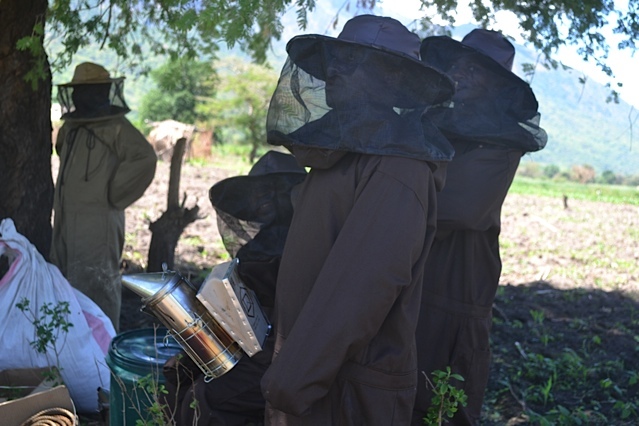 Best wishes to you Father Jacob and your team of Mahenge beekeepers! Harvesting honey with Mahenge beekeepers. 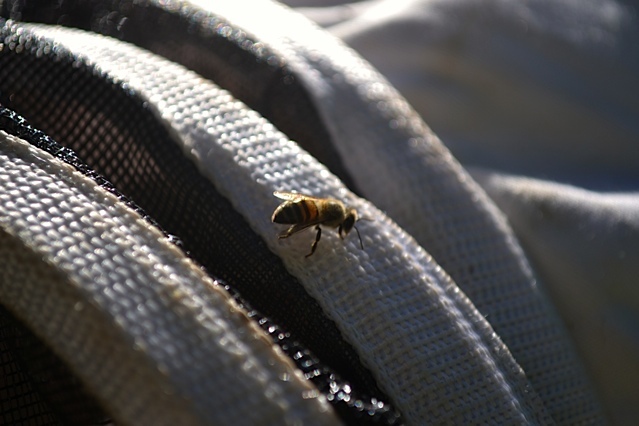 How do bees orient themselves to their new hive? Pulling a bar hive. Notice the heavy collection of propolis on the right side. If bee space is not exactly adhered to you can expect this. 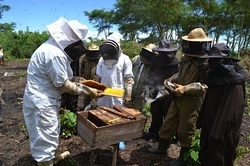 Student beekeepers watching the lowering of a hive before harvesting. 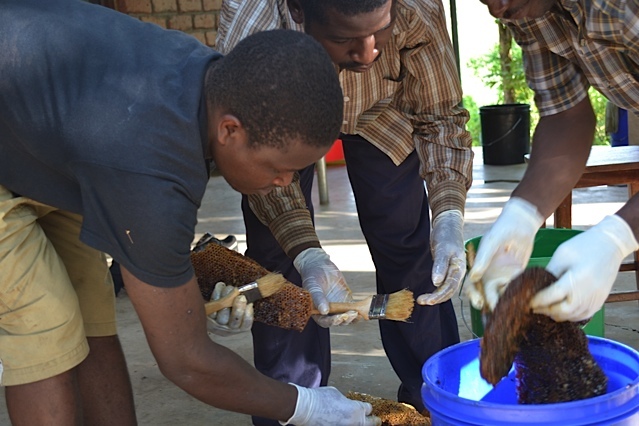 Examining comb with Mahenge beekeepers. 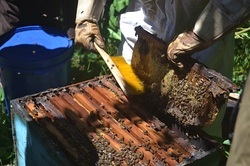 Removing honey from top bar hives by squeezing comb. Always wear latex gloves after washing your hands and arms to ensure you get a clean product. Preparing honey comb for squeezing. 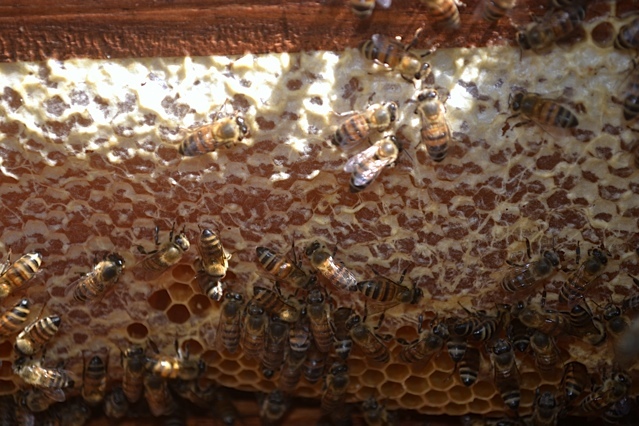 Brushing bees off of comb before cutting out any brood and excessive amounts of pollen. Beautiful capped honey with bees on Langstroth frame.